The genesis of the ongoing fascination with all things 60's and 70's remains somewhat of a mystery to me. Of course those were some intriguing and tumultuous times with quite a spectrum of interesting fashions segueing from the more paired down and repressed 50's into the mod, hip and elegant fare worn by the likes of Audrey Hepburn and Jackie Kennedy, to the wacky vibrant, sometimes kitschy and outrageous, and of course bohemian inspired 70's contingent. Maybe to go forward, we must revisit the past for inspiration and amalgamate iconic images from prior times with what fascinates us now. We are privileged to have an amazingly talented group of designers to put a new and modern spin on fashions from eras which could occasionally trend towards the ahem, tacky and sensibility offending. I have been pleasantly surprised at the wondrous spectacle of the running stream of new fangled 70's inspired runway, with the ponchos, flowy diaphanous maxi and floor length frocks, minis, bellbottoms, and macrame. When these throwbacks to a difficult time of paradigm shifts and protests hit the catwalks it was apparent a new day had dawned, and though we were embracing all things liberated and flower power, we were doing it in upscale opulence. 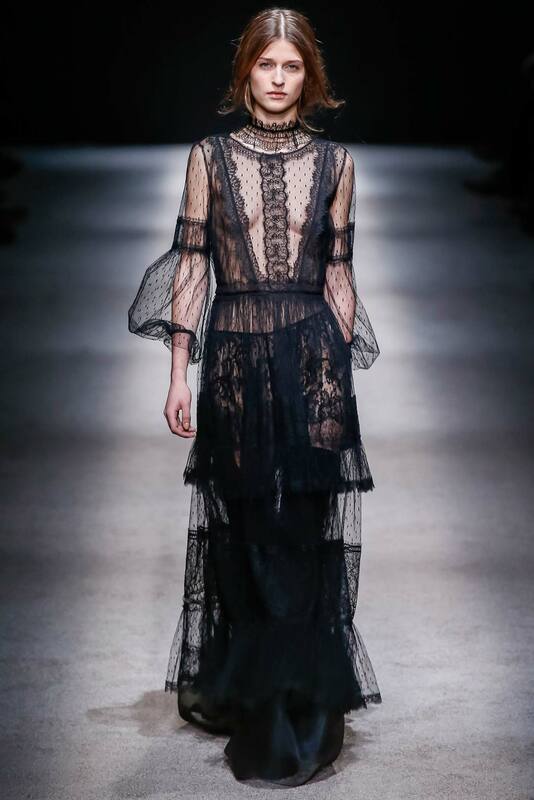 It helps to have the likes of Ghesquiere, Peter Dundas (Pucci), Chloe, and of course Alberta Ferretti reinventing the past. 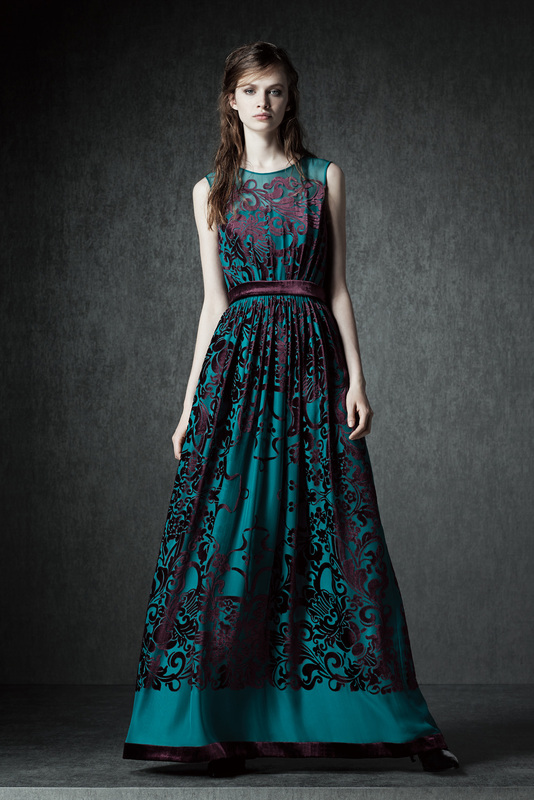 Alberta Ferretti has been at this gig for a long time, since 1973, starting her seasonal collections in 1981, designing for both her signature and Philosophy di Alberta Ferretti lines. I have a vague recollection of stumbling into her Philosophy line several moons ago, but at the time was being amazed by fire and Ann Taylor. Oh well, live and learn. 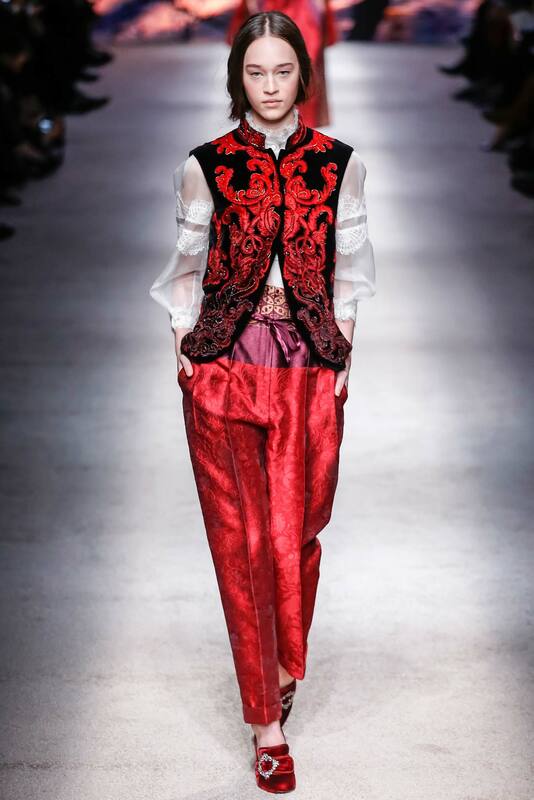 Since starting this blog several months ago, I have been stunned speechless on numerous occasions by her runway collections, the color palette, use of extravagant fabrications such as velvets, varied silkens, and jacquards, opulent embellishments, guipure laces, in dramatic and wearable silhouettes. 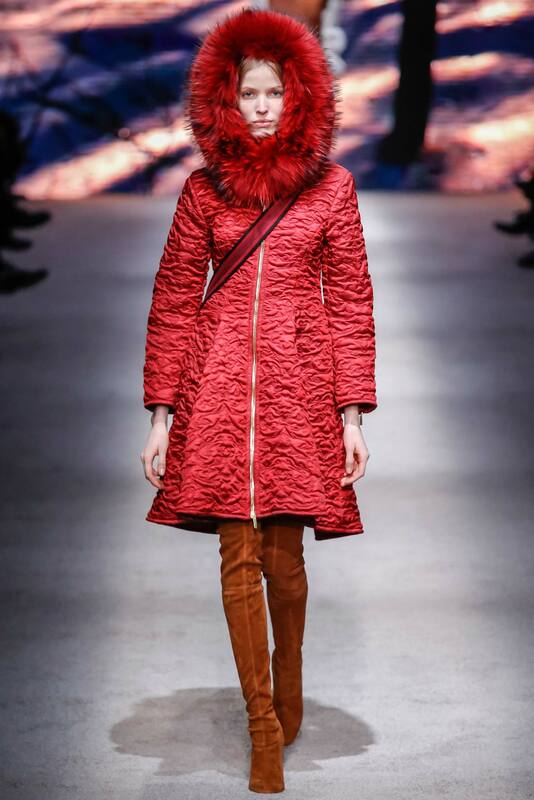 Every runway show has been a constant stream of beautiful things. 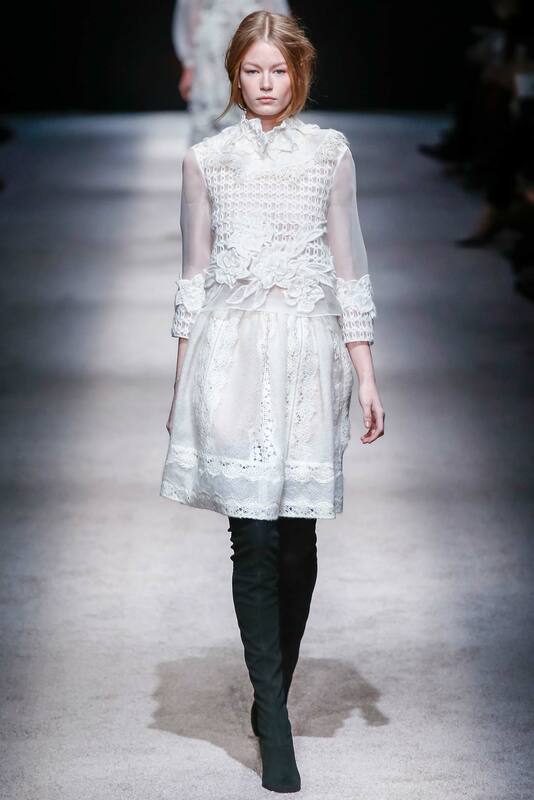 I'm obsessed by this line, a new favorite, along with Erdem and Antonio Marras. But who is carrying this jewel of a line I kept wondering? I'd wander through Saks, Neiman's, and Wilke's Bashford, and although many wondrous concoctions inhabited these bastions of fashion, there was no Alberta Ferretti to be found! Quelle Horreur! Then, my man James Krohn, a manager at Neiman Marcus broke the good news: a rep was coming with a potpourri of samples. 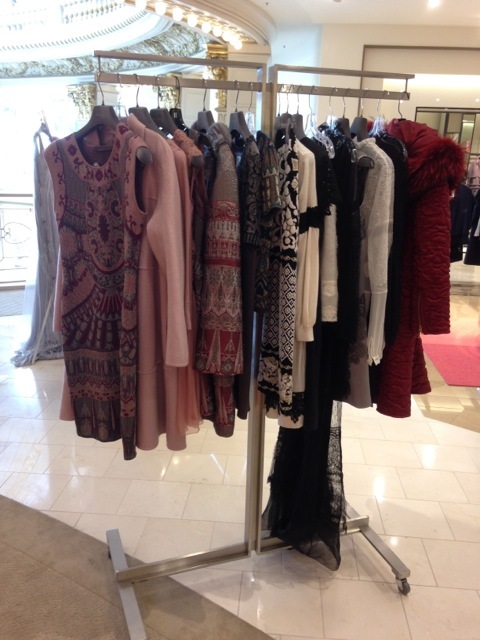 Happily, the racks were filled with the lovelies from both pre-fall and fall winter, a spectacular mixture of romantic Renaissance inspired dresses and gowns, pieces with a medieval flare, embellished frocks as latter day armor, and some of the best jackets from the recent runway selections. 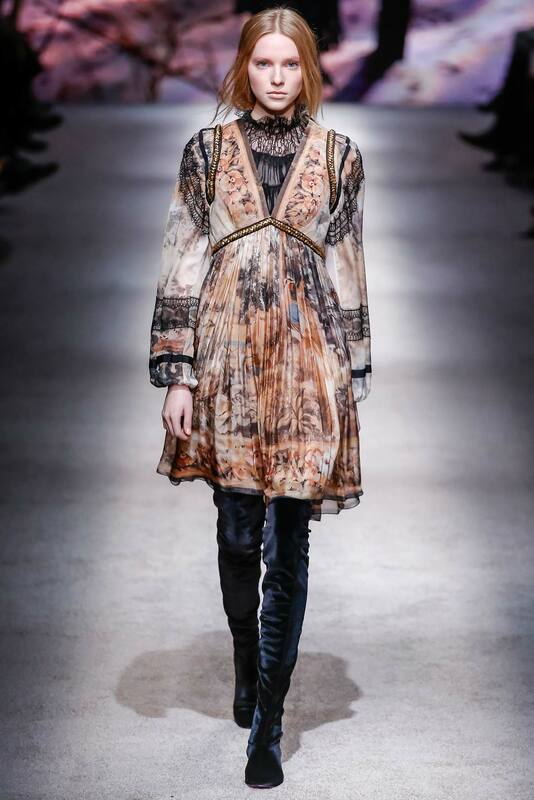 Spellbinding jacquards spicing up and elevating a more standard silhouette. (A paired down silhouette tempers extravagant fabrications with regal adornments for the more faint of heart). 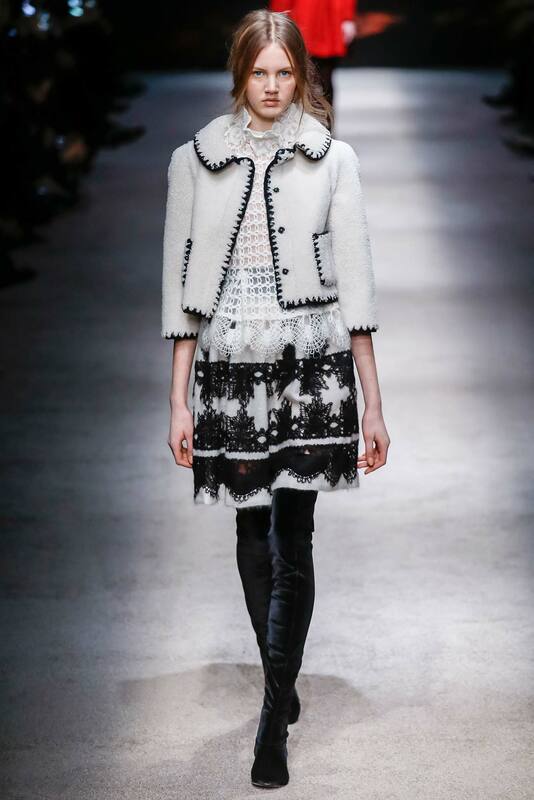 The jackets were really a version of fabulous, easy non-fussy silhouettes in unforgettable fabrications. This jacquard was one of the most beautiful I've seen, with a fascinating palette composed of claret, dusty rose, and silver, made for a noblewoman for sure. The grosgrain ribbon detail along the inside of the hem of the matching dress just spoke to the attention to detail that exemplifies these collections. This was another favorite, in pewter gray embossed velvet with appropriately placed rhinestone adornments. Would be a sumptuous addition to that fabulous fur lined jacket. Dating back to medieval times and favored by the nobility of yore, velvet was introduced to the nobility by crusaders returning from the middle east. 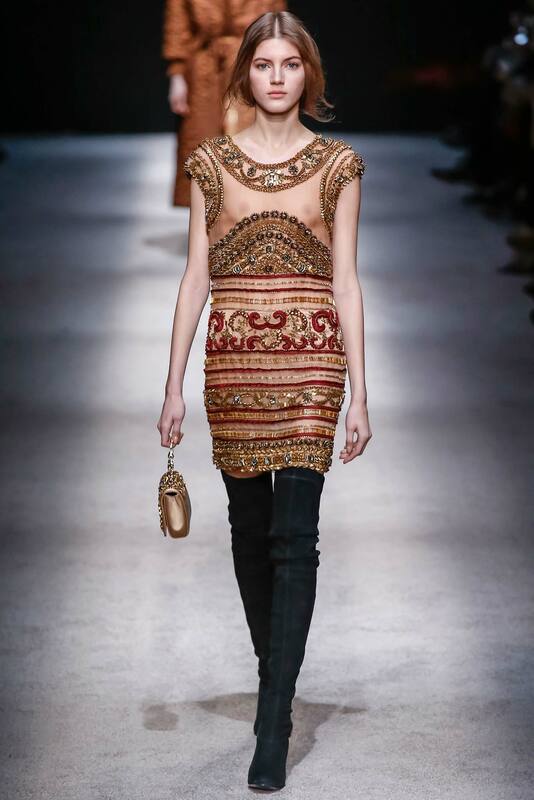 Quite apropos as Ferretti's collections have a noble quality to them. Regal, modern, perfect for any gala affair. The dress equivalent was on display as well and was quite the breathtaking number. Guipure lace detail on organza. Striking in execution, feminine and light, would be fabulous with one of the mohair skirts, a long taffeta gown, or over khaki cargo pants. This is a stellar piece to be cherished forever. The mohair skirts were quite lovely, and amazingly light weight. Perfect for traveling. 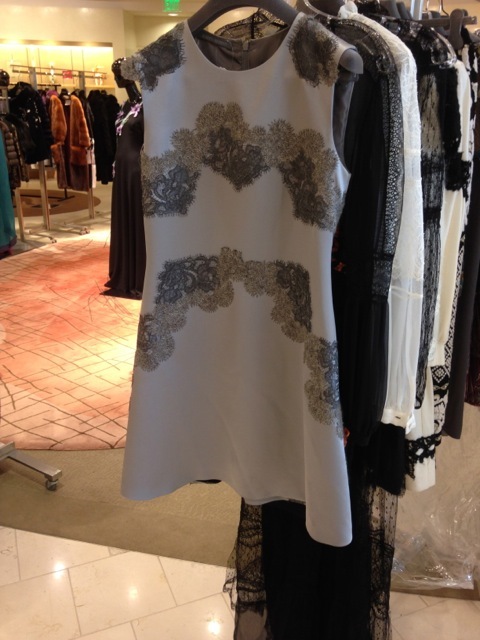 Would pair easily with jackets from Chanel or Valentino. Lace is IN. 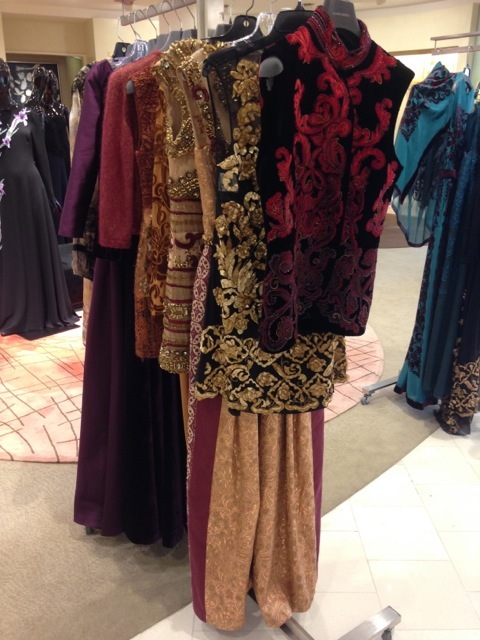 Velvet vest with intricate lavish embroidery, to be appreciated in person. Absolutely stunning, a knockout piece for the ages. Perfect over one of her flowy, folkloric blouses. I tried it on over the black chiffon blouse, kept my black leather leggings on. It all added up to a sort of Musketeer look. Huzzah! A new brilliant and glorious take on the puffer! Another favorite, to be worn as a dress, maybe with opaque hose, or as a tunic over leggings, in chiffon with a curious whimsical pattern and lace and gold metal detail. Here, the underpinning is the fabulous all purpose chiffon blouse. Another great travel option. Underpinnings or no underpinnings? Depends on one's definition of decorum I suppose. 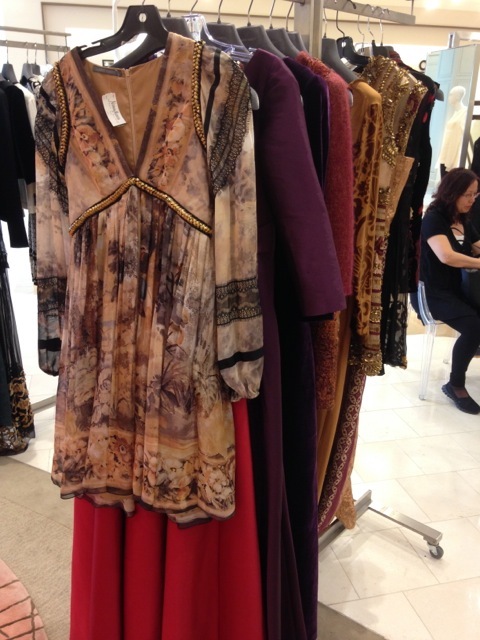 The best part of a trunk show is that one is privy to many if not all of the runway samples. You can try on any or all of the pieces to your heart's content at leisure and talk to the rep about possible changes in the garment during production. No store will buy ALL of the looks, so this might be the last chance to get your mitts on THE runway selections, which are the cream of the crop of the ready to wear. 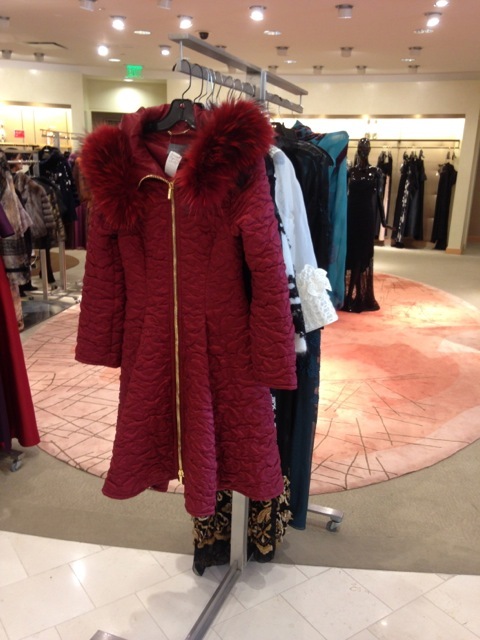 Looks like Neiman Marcus might ultimately be carrying Alberta Ferretti! Just another bright feather in their well festooned hat. I might add that the price points were quite reasonable in the scheme of things, especially given the quality of the garments. This is the time to start collecting Ferretti. Thank you James for the other pictures!